The DHSEM Mineral Office will be closed on Friday, May 19 and Monday, May 22 to exercise the agency Continuity of Operations Plan (COOP). 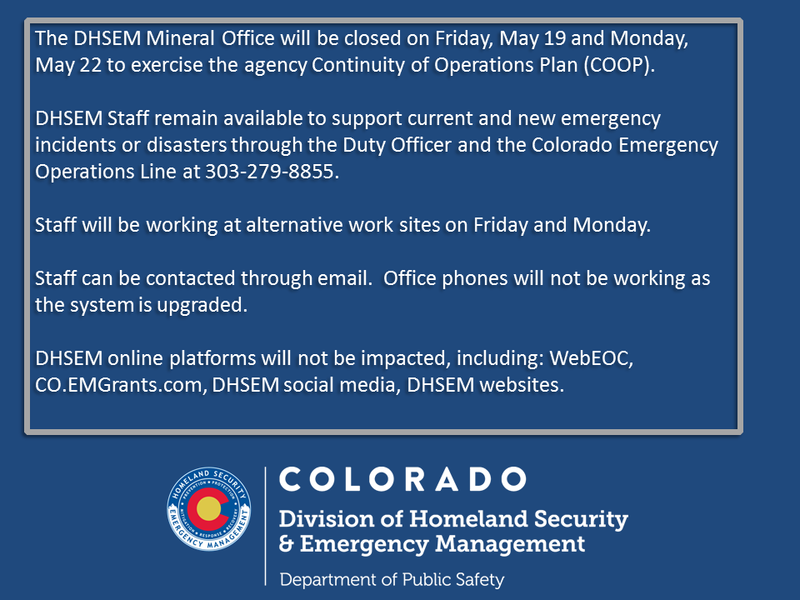 DHSEM Staff remain available to support current and new emergency incidents or disasters through the Duty Officer and the Colorado Emergency Operations Line at 303-279-8855. Staff will be working at alternative work sites on Friday and Monday. Staff can be contacted through email. Office phones will not be working as the system is upgraded. DHSEM online platforms will not be impacted, including: WebEOC, CO.EMGrants.com, DHSEM social media, DHSEM websites. Updates will be posted to our DHSEM website and COEmergency Twitter and Facebook platforms if any changes occur.